No. AB. 14017/61 /2008-Estt. (RR)/Pt. 2. As the Recruitment Rules/Service Rules are required to be amended after incorporating the above instructions, all the Ministries/Departments/Cadre Controlling Authorities of Organized Group ‘A’ Services may take immediate necessary action for notification of Service Rules positively by 31 .3.2012 in consultation with DOPT/UPSC & Ministry of Law. Decision of the Government on the recommendations of the Sixth Central Pay Commission relating to re-classification of cities/towns for grant of House Rent Allowance (HRA) to Railway employees. 1. Attention is invited to para 6 of Board’s letter of even number dated 12.9.2008 on the above mentioned subject, vide which the special dispensation for grant of HRA has been allowed to continue to (i) Faridabad, Ghaziabad, Noida & Gurgaon at “X” class city rates and (ii) Jalandhar Cantt. Shillong, Goa & Port Blair at “Y” class city rates and to state that the special dispensation allowed to Panchkula for grant of HRA at par with Chandigarh vide Board’s letter No. E(P&A)ll-2003/HRA-6 dated 19.8.2003, shall also continue. 2. In this context, it is also clarified that any other similar special dispensation allowed by the Railway Board in the past in respect of other cities or grant of HRA at higher rates and not specifically mentioned in Board’s letter of even no. dated 12.9.2008. shall continue to apply, if the same has not been superseded/dispensed with or the existing classification of such city has not been revised to higher classification on account of the population criteria, vide Board’s letter of even no.dated 12.9.2008. D.A. reached 51%, Following allowances and advances to increase by 25%, automatically. As per the announcement the Dearness Allowance is increased by 6% from 45% to 51% to Central Government Employees and Pensioners.The decision would also change the allowance structure. There is no recommondations in 6th CPC that Dearness Allowance crosses 50% would merge with baisc pay. But some allowances and advances will be increased by 25% on crossing of Dearness Allowance by 50%. All the following allowances are to be increased with effect from 01.01.2011. 8. Mileage for road journey all components of daily allowance on tour, rate of transportation of personal effects. As reported here earlier, the letter on modified parity for casualty awards has finally been issued. Casualty awards from now onwards are to be calculated based on 6th CPC scales. The letter can be accessed and downloaded by clicking here. Please do not mail me individual requests for the same, such requests shall not be replied to. Special Family Pension : Would not be less than 60% of minimum of 6th CPC pay band + Grade Pay + Military Service Pay + X Group Pay (wherever applicable) corresponding to the rank held. Liberalized Family Pension : Would not be less than the (100% of) minimum of 6th CPC pay band + Grade Pay + Military Service Pay + X Group Pay (wherever applicable). Disability Element : Would not be less than 30% of the minimum of 6th CPC pay band + Grade Pay + Military Service Pay + X Group Pay (wherever applicable) for 100% disability, proportionately reduced for lesser disability. War Injury Element : Would not be less than 60% of the minimum of 6th CPC pay band + Grade Pay + Military Service Pay + X Group Pay (wherever applicable) for 100% disability proportionately reduced for lesser disability in cases of retirement / discharge and 100% of the minimum of 6th CPC pay band + Grade Pay + Military Service Pay + X Group Pay (wherever applicable) for 100% disability proportionately reduced for lesser disability in cases of invalidment. Other finer modalities can be seen from the letter. 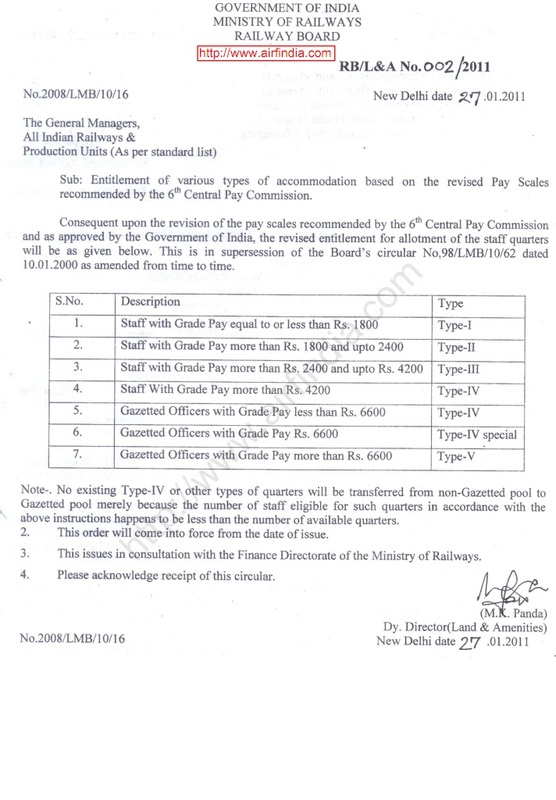 Entitlement of various types of accommodation based on the revised pay scale recommendation by the 6th CPC. dated 17.03.2010 & Circular No. 438 dt. 16.07.2010. 1. Kindly refer Para 3 of this office circulars cited under reference under which aggregate of the relief / ex-gratia compensation paid from different source does not exceed Rs. 20 Lakhs in each individual case has been circulated. 2. Now in terms of GOI, MOD letter No. 20(5)/2009/D(Pay/Sers) dated 17.08.2010 (copy enclosed) there will be no ceiling for grant of ex-gratia lump sum compensation i.e. aggregate of the relief / exgratia compensation paid from different source may exceeds Rs. 20 Lakhs wef 01.01.2006. 3. In view of the above you are requested to submit all affected cases of ex-gratia lump-sum-compensation were aggregate of the relief / ex-gratia compensation paid from different source has been exceeds Rs. 20 Lakhs which occurred on or after 01.01.2006 to the OI/C, G-4 Section of this Office . dt. 26.5.2009 and Circular No. 437 dt, 03.06.2010. A ready reckoner table is enclosed to recognize the table applicable to Naval PBOR shown minimum pension for 15 years of qualifying service for each rank and group. The payment may be made accordingly. Further, it is observed that Annexure ‘A’ attached to this office circular No. 430 dated 10.03.2010 is being forwarded to PCDA Navy in case of all Navy, Air Force and Army PBOR who retired prior to 01.11.1985. In this connection it is advised that Annexure ‘A’ in respect of Navy and Air Force pensioners who retired prior to 01.11.1985 and all Army pensioners irrespective of date of retirement may be forwarded to this office. Annexure ‘A’ in respect of Navy and Air Force PBOR who retired on or after 01.11.1985 may only be forwarded to PCDA Navy Mumbai and CDA (Air Force) New Delhi.